Version 4.5.4 will go online on Monday 3rd November. For this latest release we’ve added a new feature to help your clients manage how their email template appears under Gmail’s Promotion tab and also some improvements to the Email Designer. Earlier this year Gmail announced changes to their Inbox display, including the announcement of the Promotion tab. Gmail displays each email that gets picked up in Promotions tab with a large feature image, brand logo and feature text – with heavy emphasis on the visuals as opposed to a simple plain text subject line. The additional feature we’ve added to Instiller will make it easier to ensure your email displays correctly under Gmail’s Promotion Tab. It’s worth noting that this Gmail feature is not yet enabled for all Gmail accounts and may change as they refine the new feature. 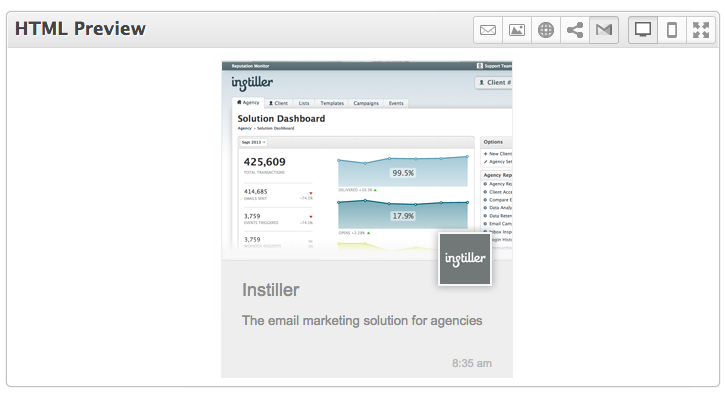 If you use Instiller’s Email Designer we’ve added some controls to easily add the required meta data for the promotion tab layout. You can simply drag and drop your feature image in place (Google requires the feature image to be 580x400px in dimensions) and fill in the necessary fields. A further prerequisite is that the campaign is linked to the relevant brands Google+ profile page. Additionally, you can add the Gmail meta data code to your own templates and upload as normal. 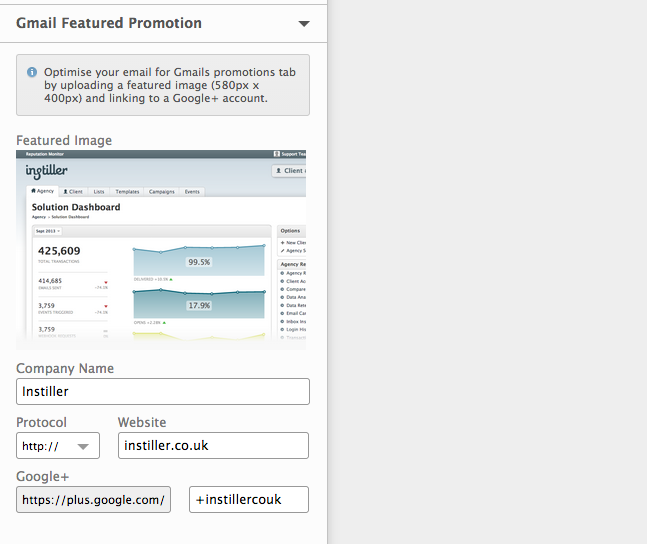 Instiller will recognise the inclusion of this meta information and allow you to preview the promotional layout. If you choose either of the above methods to add Google Promotional data, you can preview the display in Instiller prior to sending. We’ve also added the preview rendering to Template Feedback so clients can feed back on this display at the same time as giving feedback on the email template itself.